There is little doubt Barack Obama became president at a very difficult time. As he took office the greatest recession in years was overtaking the country and the nation had barely missed a complete financial meltdown. It would be over a year into his presidency before the recession hit bottom and when it did in June 2009 the unemployment rate was 9.5% and the U.S. economy was in a world of hurt. Now with over three years of “economic recovery’ under its belt you would think things would be looking up but the reality is most Americans feel the recession never left! In fact since Obama took office American households have seen over a $4,000 drop in wages (about $3,000 of that coming after the start of the so called recovery) and a $40,000 drop in net worth while at the same time the percentage of Americans employed is the lowest in 31 years. With all of this it is no wonder most Americans still feel they are in a recession. Maybe that is because while the United States may not be in a technical recession it is still in a practical one. The economic growth rate has been so low that it is not been keeping up with the growth in population. Like walking up the wrong way on an escalator, if the economy is not growing fast enough the GDP per person goes down. Unfortunately the U.S. economy has consistently below the estimated 2% growth it needs to just break even. That means that despite all the reports touting economic growth for all practical purposes the economy is contracting in comparison to the population. The result is the state of the economy is abysmal and progress is virtually non-existent for most Americans. Given the state of things it is no wonder wages, wealth and consumer confidence continue to plummet. The latest statistics from the Labor Department seem to be emphasizing what is effectively a shrinking economy. They reported that the economy added 96,000 jobs last month while at the same time 368,000 dropped out of the work force, a proverbial one step forward and 3.833 steps back. As if to throw salt in the gaping economic wound, those few jobs being produced are mostly low paying service jobs with bars and restaurants leading the way. It seems that the number of long term unemployed has been a boom to the bar business if nothing else. The President’s response to the situation is to say things are going in the right direction and hailing the drop in unemployment from 8.3 to 8.1 (even though that was wholly due to the 368,000 people who stopped looking for work). Similarly at the convention Vice President Biden hailed that the U.S. had turned the corner on economic recovery. 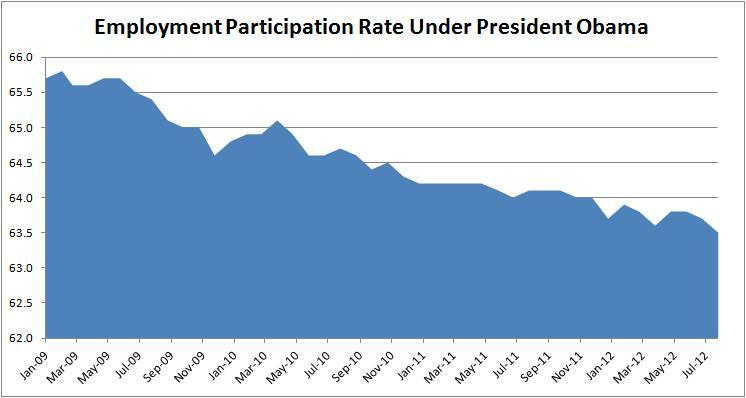 The sad truth is this is an invisible recovery for most Americans, a ghostly visage that only the Democratic Party faithful can see. For most Americans the recovery that the administration is touting has been a mirage, a legend like the Sasquatch that some swear is real but no solid evidence of its existence can be found. Unfortunately the specter of a bad economy that just refuses to fade away has plenty of evidence to back it up. Love your essays. I will link every one from my news site: http://popmod.com.